Yesterday, a dear friend of mine turned 40. I had met her at a local new-moms' group when our babies were a few weeks old. When she opened her mouth and introduced herself, I thought, "we should be friends; this woman is fabulous." Weeks after we met, she said, "I knew we were going to be friends the second you started talking!" She's one of the best friends I've ever had. Over six years later, I'm still close with her and many other moms we met at that group. Before I became a mom, I had friends--great friends, even. But once my son was born, those friends either lived too far away to drive with a screaming baby, or had minimal interest in hearing about diaper disasters, breastfeeding woes, and endless fatigue. At a new-moms' group, though, we talked about all of this. Meeting new-mom friends is a bit like dating. You click with some moms more than others. You have chemistry with some folks and less in common with others. And, like dating, you have to put yourself out there: part of making connections and starting relationships often involves making yourself vulnerable, and, for better or for worse, the immediate postpartum period is often rife with vulnerability. That said, it's not always easy to make yourself vulnerable, shed tears, and speak honestly to strangers, especially with so many pressures from our culture to be perfect and confident. It's often easier to share our successes than it is to share our fears, anxieties, and losses, especially in the online world. Don't get me wrong; I love social media as much as anyone else, but it's easy to censor yourself online and post the perfect Facebook photo or a cute status update. But, carefully edited blog entries and short updates can only reveal so much, and in the realm of the internet, we can present ourselves any way we want to. I think there's a unique intimacy and familiarity that comes with speaking face-to-face with other moms. Many of us bond while holding someone else's baby so she can eat her soup without spilling it, sharing a packet of wipes to clean up a diaper blow-out, and spontaneously ordering take-out together when our partners are working late. Being with a tiny baby all day can be boring, exhausting, and stimulating in all the wrong ways. The sleep books and mommy blogs are interesting and helpful at times, but sometimes a new mama doesn't need more information or witty commentary; she needs friends. She needs company and a tribe with whom to share her experience. She needs people who will say, "I get it. This is hard. You're doing a great job." She needs people who will help her feel normal, grounded, sane, and confident. She needs people who will help her feel less isolated, alone, and stuck inside her own head and fatigue. I was lucky enough to find these folks, and they have saved my sanity countless times over the past six years. These friendships that were forged in the crisis of new motherhood are dynamic and have evolved with time. When we first met, my group of mom friends got to know each other through our babies and through our experiences as mothers. We knew who was struggling with breastfeeding and whose baby was fussy. We knew whose baby slept well and who was exhausted. The initial crisis of motherhood can be all-consuming and can temporarily usurp your entire identity. Once that initial crisis abated, we talked about our careers, places we had traveled, old college friends, and pieces of us that extended beyond our experience of motherhood. In time, we found ourselves again and became not JUST mothers but also ourselves again. Together, we figured out how to integrate our sense of ourselves with our experience of motherhood. I now provide prenatal and postpartum support for new parents, and my one piece of advice to them is to get out of the house, go to a new-parents' group, and make friends. Talk to each other. Speak honestly and candidly if you can. Talk about what's funny, what's hard, what's scary, and what's true for you. Listen to each other. Allow yourself to be vulnerable. Go have a coffee and take a walk together. Go have a drink. When people ask me how I got through my son's first year, I unequivocally say, "with new-mom friends." Organizations like MotherWoman lay the groundwork to make these connections possible. MotherWoman trains support group facilitators so that new parents' groups can provide a safe, welcoming, nurturing environment for mothers to speak honestly and share their experiences. If you're pregnant, while you're searching for a pediatrician or a childbirth class, I encourage you to also look for a new parents' group in your area. We live in a society where new moms are often isolated and separated, and creating community can make the difference between surviving the first year and surviving it with honesty, camaraderie, and some much needed humor. I encourage moms in my groups to text each other and say, "I'm having a bad day! Who can come over with wine and chocolate?" Because anything is better when we're together. Yes, social media has its benefits, but a real live friend in your house on a cold, rainy February afternoon is golden. My friends and I made a village together, and I am a better mother because I had their support, listening ears, and love. Author's Bio: Divya Kumar has a public health background and has worked in the field of women's health for 14 years providing sexual health education, anti-violence programming, and advocacy for survivors of violence. 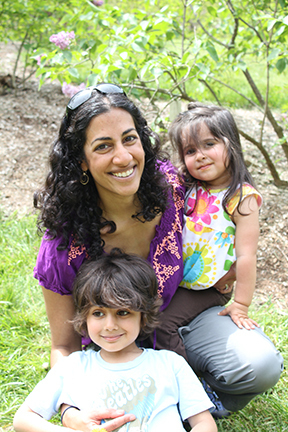 Certified as a lactation counselor and postpartum doula, Divya is the Director of Prenatal and Postpartum Programs at Mama & Me in Jamaica Plain, MA. She facilitates pre- and post-natal groups at Mama & Me and in the local community and provides support and information for new and expectant parents. Divya works from an empowerment-based approach and encourages new parents to trust themselves and their parenting instincts. She is committed to helping new parents build connections in their community and hopes to bring honesty, compassion, camaraderie, and humor to the transition to parenthood. She lives in Jamaica Plain with her husband and 2 children. Support MotherWoman by making a gift on Valley Gives Day 12.12.13.